scroll down for a list of categories in Giftware. 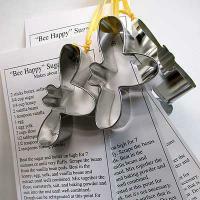 A cute cookie cutter ... to make your own beehive's worth of bees :-). Recipe provided, but works with any firm cookie dough. 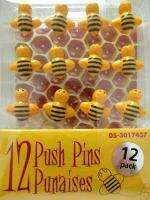 Add a bee-themed touch to your bathroom. 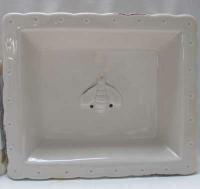 Keep your soaps dry in this elegant ceramic soap dish, featuring our favourite pollinator in a light cream coloured relief. Out of stock. Your valuable wood furniture and concrete kitchen countertops deserve both nourishment and protection. 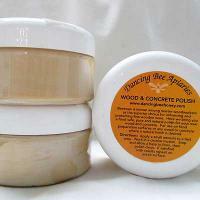 Get that with Dancing Bee Polish, made from pure 100% Ontario Beeswax. Currently out of stock. 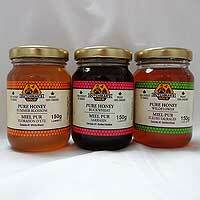 A fun way to sample different flavour profiles, featuring Summer Blossom, Wildflower & Buckwheat honeys, each jar 150g. Wrapped in cellophane for gift giving. Marvel at the Beauty of the Bee. Original photographs taken by Toronto Area beekeepers & their friends adorn these greeting cards, blank inside, envelope included, photographer credits on back. Set of 5 assorted. Professional Casino Playing Cards, the Jokers are flying on the backs of bees :-). Card backs are blue. Professional Casino Playing Cards, the Jokers are flying on the backs of bees :-). Card backs are red. 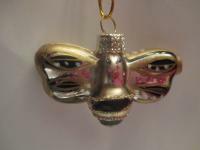 A dainty blown glass ornament, perfect for the collector of "things bee", as a Christmas tree ornament or window adornment. Mini size is 5cm wide x 3 cm tall (2" x 1"). 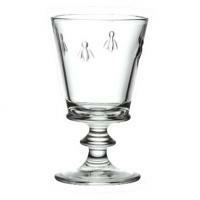 Classic and modern design "Abeille" drinkware by La Rochere. Made in France. 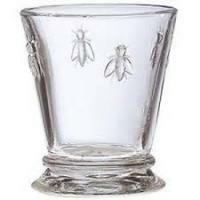 We have a bee-utiful selection of LaRochere glassware in stock. Unique Hand knit hats + touques (Canadian, eh?) 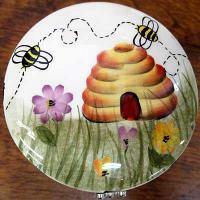 in bee themes, by Mira a neighbour local to our store. Acrylic yarn. Each hat is a work of art! Many more styles available in store. Photo has brim rolled up. Unique Hand knit hats + touques (Canadian, eh?) in bee themes, by Mira a neighbour local to our store. Acrylic yarn. Each hat is a work of art! Many more styles available in store. 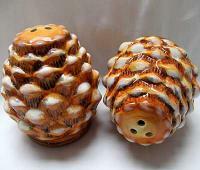 Click on a category in Giftware to view Products.